Casa los Mangos is located in the city of Trinidad, Cuba, a short walk away from the historical centre and shopping district. The house is set amongst a very large garden with an established grove of mango, banana and avocado trees and a wide variety of tropical plants. It catches the sea breezes from the Ancon Peninsula, with its superb snorkeling/diving sites and tranquil white sand beaches, nearby. GPS 21° 47'56.50 N 79° 59'33.20 W Elevation 51m. There are two spacious rooms for rent, 2 twin rooms with two double beds. Both rooms include air conditioning, hot showers, fans, mosquito nets, minibar, en-suite, a private entrance, 240 v and 110v power points and access to a large verandah. The verandah overlooks the garden and has outdoor furniture and hammocks for our guests use. There is off street security parking, bicycles and snorkeling gear for hire and guests are welcome to stroll through the orchard and sample our fresh produce. We offer breakfast, lunch and dinner. All meals are served on the verandah or in the dining room and we cater for vegetarians and other dietary requirements. At Casa Los Mangos we also grow herbs, vegetables and other fruits. Picnic lunches are available upon request. Whilst we can prepare a wide variety of cocktails, fruit juices and smoothies, the house speciality is a mango daiquiri. Your hosts are Fiona Wilson, an intrepid world traveller now resident in Cuba and her husband Ossiel Ramirez Perez, a local Cuban musician and artisan. As well as being a talented musician Ossiel is a keen fisherman and enjoys escorting our guests to his favourite fishing spots. He can also teach guitar, salsa dancing and percussion. Fiona is a keen hiker and has climbed a few high altitude peaks in her youth as well as Cuba's highest Mountain, Pico Turquino, and is happiest exploring the trails in the hills behind Trinidad and horseback riding through the valley. An oasis ! What a wonderful place and what amazing hosts! From Fiona's kindness and hospitality and Ossiel's fabulous singing voice, along with their lovable dogs, cat and delicious meals, this place is truly a find! Only a 10 minute walk from town centre, this casa is hidden in a luscious garden. Fiona gives great recommendations and advice for going out or you can choose to stay in and enjoy a home cooked meal and cocktails in good company. How was your room? :	Very clean and spacious. There is mosquito netting on the beds and a "I think I may stay here forever" hammock on the patio. How was the food they offer? :	The food was fabulous (copious amounts and fresh fruit and vegetables plus a delicious ropa vieja) and if you happen to be there the day ice-cream gets delivered...well let's just say that an ice-cream treat for breakfast never goes unappreciated! Other services they offer:	Both Fiona and Ossiel are happy to help you with any of your plans, from hiking, day outings to getting taxis back to Havana. All you need to do is ask. Other comments:	I cannot recommend Casa Los Mangos enough and I know that I will certainly be coming back. What a wonderful stay! Wow! That's about the only way I can sum up our stay at Casa Los Mangos. Fiona and Ossiel could not have been welcoming or helpful from the moment we arrived in Trinidad. We were greeted, given a tour of our rooms and a few minutes to relax before being presented with a mango daiquiri. Fiona then provided us with details of things do in Trinidad, including restaurant recommendations (which were spot on - La Redaccion is a must visit when in Trinidad) along information around certain activities with a high level estimate of time needed and costs involved. When we decided on a short hike, she very kindly arranged transport for us and she also helped us get a taxi to our next destination with a short stop in Laguna Guanaroca (also a good spot if you like flamingoes). 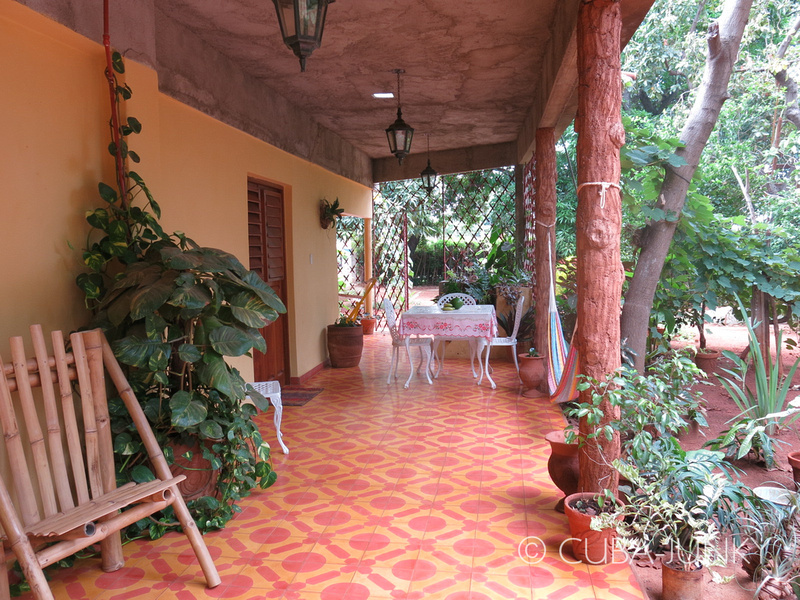 The casa itself is gorgeous situated with a big garden that has lots of fruits and veg growing. How was your room? :	We ended up booking both rooms between 3 people although 1 room would have fitted all 3 of us. The rooms were very clean with air con and the bathrooms were nice. How was the food they offer? :	Amazing - we only had breakfast there but were provided with fresh eggs, avocado, fruit and 3 different types of bread. Other services they offer:	They will help you organise activities - it's probably best to give Fiona an idea of what it is you would like to do while in Trinidad and she can help. Other comments:	This was our favourite casa that we stayed in while in Cuba. 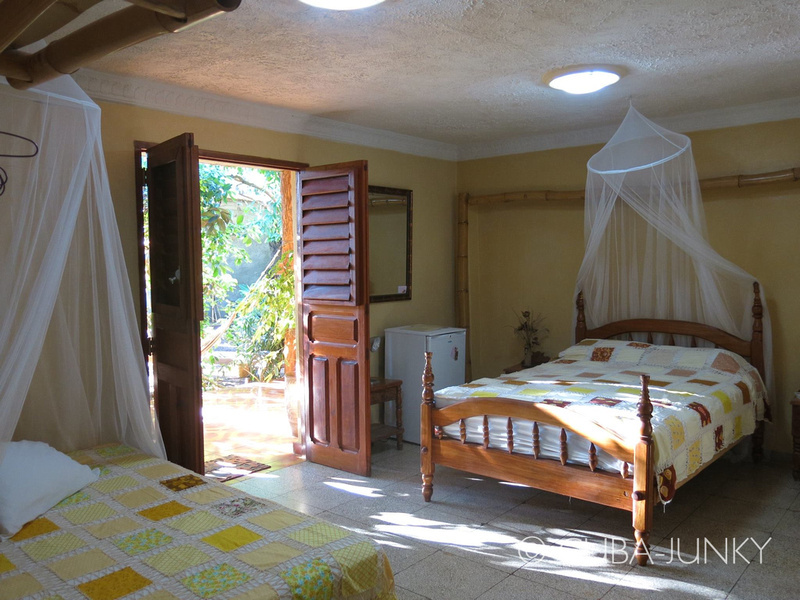 We strongly recommend Casa Los Mangos; a beautiful and peaceful house 8 min. walk from the center of Trinidad. 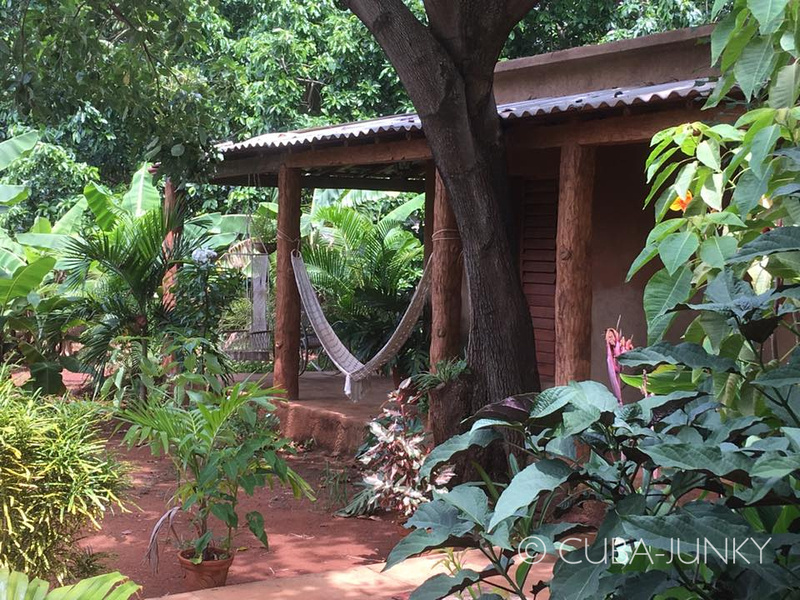 The house has an amazing garden full of plants and trees such as avocado trees, banana palms and mango trees which make you feel completely disconnected from the rhythm of the town. The best part of staying with Fiona and Ossiel is how friendly, helpful and kindhearted they are. From the beginning they made us feel very welcome and part of the house. We enjoyed the time in Casa Los Mangos walking around the beautiful garden, discussing life in Cuba with Fiona and being serenaded with Cuban songs by the fantastic voice of Ossiel. It was definitely the best place we stayed in Cuba and we would love to go back. How was your room? :	The room was very spacious with two comfortable double beds, a wardrobe and plenty of space for storing suitcases. Each bed has a mosquito net, which is very helpful as there can be some mosquitos around. The room has both AC and a fan and a fridge with cold drinks, which was really convenient in preparation for daily outings. Casa Los Mangos does daily house keeping and the room and bathroom were always spotless. How was the food they offer? :	We had breakfast every day at Casa Los Mangos during our stay and thoroughly enjoyed the fresh juices, fruits, home-made jam and the best homemade banana bread you'll ever taste - the bananas, guava and passionfruit are all grown at Casa Los Mangos! The portions are quite big and will keep you going for most of the day. We also had dinner twice in the house, and had the best lobster we tried during our trip around Cuba as well as the most amazing ropa vieja. Both accompanied by perfectly mixed cocktails (especially the canchanchara - also best in town!). Other services they offer:	Ossiel picked us up at the Viazul station, which was extremely helpful as we avoided looking for and negotiating with a taxi. Fiona gave super accurate and helpful tips on where to go and what to see in and around Trinidad. Fiona and Ossiel are ready to help you with any possible activity you can imagine, such as organising shared taxis for day trips, renting snorkels, beach towels and bikes. This was simply the best Casa Particular we found in the whole of Cuba! How lucky we were to be able to stay here! Fiona and Ossiel are amazing hosts who have put in a lot of effort to create something special on a very special property in a great location. We traveled as a family of four and had two rooms. The rooms are very spacious, nicely decorated and both have access to a covered verandah which is true bliss in the hotter months of the year or when tropical rain comes down. From the verandah you can access the garden where Fiona and Ossiel are growing their produce, chickens roam and the hummingbird comes flying by. The bathrooms are very nice and have showers with good pressure! We also enjoyed the location walking 5-10 minutes to the heart of Trinidad, while having the chance to get a glimpse of real life in Trinidad because you first go through a small part of Trinidad that hasn't been adjusted or upgraded for tourists. We recommend grabbing a pizza on the way! But, don't eat too much as you do want to enjoy the dinner at the casa as well as that again was one of the best we had in Cuba. The breakfast is even better - so much fresh, home made or locally made food we were craving and have not seen anywhere else on our month's trip. And it all comes down to Fiona and Ossiel who made it all happen. Not only were they always very welcoming when we came "home" after a day at the beach, the national park or the city, but they also gave us personal space when needed and continued with their normal life or embraced our company. Salsa dancing, singing, fishing or just a talk - we have thoroughly enjoyed meeting them, believe their both very special end have created a little gem in Trinidad. How was your room? :	Very spacious, very clean and tidy and very private. How was the food they offer? :	The food was tremendous. They love good food and can cook very well! I thoroughly enjoyed my stay at this Casa. It is just outside the town of Trindad (10/15mins walk from the centre) which makes it feel like a tucked away resort despite it being very close to all of Trindad's liveliness. Fiona and Ossiel were great hosts & cooks - the food for breakfast and dinner was delicious and they were more than helpful in organising tours/bikes rental/taxis etc. My room was perfect - very spacious and clean, aircon and shower were excellent too. This Casa is ideal for travelers looking for something a little different, it's a very relaxing place to stay and a great place to base yourself while exploring Trinidad & surrounding area. Abbiamo alloggiato X 3 notti occupando tutte e 3 le stanze ( eravamo in totale 7 persone ). La casa si trova a 10 minuti a piedi da Trinidad, in un giardino di piante dibmanho. Io e mio marito abbiamo occupato la stanza che si trova in uno stabile separato dalla casa e pertanto con più privacy; le altre 2 stanze, più spartane rispetto alla nostra, erano orientate sul portico della casa principale è un po’ buie. L accoglienza di Fiona è stata ottima: ci ha fornito un sacco di informazioni su Trinidad e sulle cose da vedere. La colazione è stata ottima con prodotti freschi. How was your room? :	La stanza era un po’ spartana ma molto spaziosa; il bagno ok.
How was the food they offer? :	Abbiamo solo fatto colazione es era ottima. Prezzo 5 cuc a persona. Other services they offer:	Gite, biciclette, organizzazione taxi..
Dear Cuba Junky, this mail is just to inform you that we had a great time with Fiona and Ossiel in Tinidad. Their house and their friendliness are outstanding and we enjoyed our stay with them very much. We will highly recomend both your organization and the guest- family. Once we have saved enough money, we will definitely come back.